Ever since the horrors of submarine warfare became a key issue during World War I, submarines have had a sinister reputation. And the building of new, immensely costly, nuclear-armed submarines by the US government and others may soon raise the level of earlier anxiety to a nuclear nightmare. This spring, the US government continued its steady escalation of research and development funding for the replacement of its current nuclear submarine fleet through one of the most expensive shipbuilding undertakings in American history — the phasing-in, starting in 2031, of 12 new SSBN(X) submarines. Each of these nuclear-powered vessels, the largest submarines the Navy has ever built, will carry up to 16 Trident ballistic missiles fitted with multiple nuclear warheads. All in all, this new submarine fleet is expected to deploy about 1,000 nuclear warheads — 70 percent of US government’s strategic nuclear weapons. From the standpoint of civilians, the new Trident submarine fleet is somewhat less appealing. Strategic nuclear weapons are the most destructive weapons in world history, and the use of only one of them over a large city could annihilate millions of people instantly. If the thousands of such weapons available to the US government and other governments were employed in war, they would incinerate most of the planet, reducing it to charred rubble. Thereafter, radioactivity, disease, nuclear winter, and starvation would end most remaining life on earth. In addition, when the dangers are so immense, it is worth keeping in mind that people, like the high-tech nuclear submarines, are not always infallible or reliable. Submarine crews — living in cramped quarters, bored, and isolated for months at a time — could well be as plagued by the poor morale, dishonesty, drug use, and incompetence found among their counterparts at land-based nuclear missile facilities. People might be forgiven for feeling some bewilderment at this immense US government investment in a new nuclear weapons system — one slated to last well into the 2070s. After all, back in April 2009, amid much fanfare, President Barack Obama proclaimed “America’s commitment to seek the peace and security of a world without nuclear weapons.” This was followed by a similar commitment to a nuclear weapons-free world made by the members of the UN Security Council, including five nuclear-armed nations, among them the United States. But, as this nuclear weapons buildup indicates, such commitments seem to have been tossed down the memory hole. In arguing for the new Trident submarine fleet, US military leaders have pointed to the fact that other nations are maintaining or building nuclear-armed submarines. And they are correct about that. France and Britain are maintaining their current fleets, although Britain is on the verge of beginning the construction of a new one with US assistance; Israel reportedly possesses one; China is apparently ready to launch one in 2014; India is set to launch its own in 2015; and Pakistan might be working to develop one. Meanwhile, Russia is modernizing its own submarine ballistic missile fleet. Even so, the current US nuclear-armed submarine fleet is considerably larger than any developed or being developed by other nations. Also, the US government’s new Trident fleet, now on the drawing boards, is slated to be 50 percent larger than the new, modernized Russian fleet and, in addition, far superior technologically. 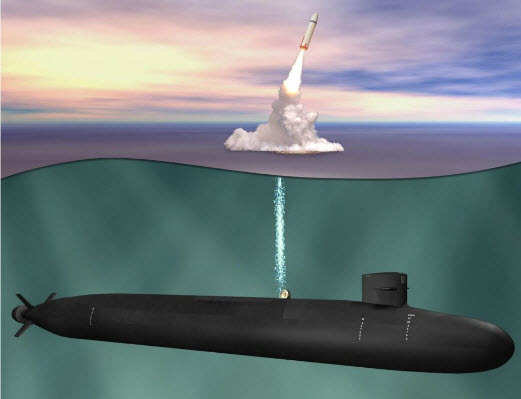 Indeed, other nations currently turning out nuclear-armed submarines – like China and Russia — are reportedly launching clunkers.